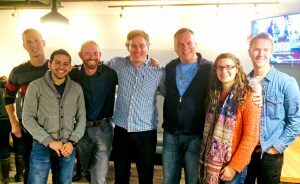 Theology on Tap sessions are faith-related presentations and theological discussions that are held for young adults (19+) in the relaxed atmosphere of Louis’ on Campus at the University of Saskatchewan in Saskatoon. 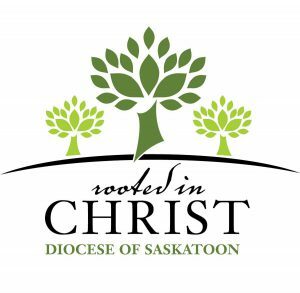 Theology on Tap is a collaborative effort involving St. Thomas More College Campus Ministry, Diocese of Saskatoon Youth Ministry Office, and Eparchy of Saskatoon Young Adult Ministry. 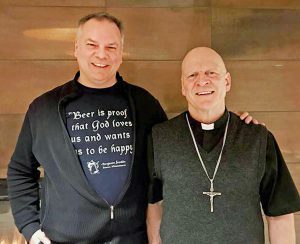 MC Michael MacLean recently welcomed Bishop Mark Hagemoen as a guest speaker at Theology on Tap, held for young adults at Louis’ pub on the U of S Campus.